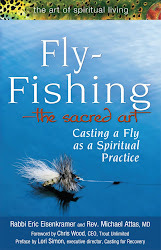 The Fly Fishing Rabbi: Why Do People Convert to Judaism? Why Do People Convert to Judaism? A few weeks ago during Shabbat Services, one of our Temple members, Lily, came up to the bimah. She stood before the open ark and sang the Shema. Lily received her Hebrew name, Liyah and I blessed her in front of the congregation, completing her conversion to Judaism. It was a beautiful and holy moment. Why do people like Lily convert to Judaism? Some people become Jewish in order to marry a Jew. One summer while in Rabbi school, I taught a class entitled Introduction to Judaism. The vast majority of the class consisted of interfaith couples, a Jew and a non-Jew, that were engaged to be married. The non-Jews in the class were taking a first step towards raising a Jewish family and converting to Judaism. Marriage is not the only reason that people convert, although it is probably the most common. Many converts report that they became Jewish because it is the religion that makes the most sense to them. One convert I know said that she loved how Judaism believed in an invisible spiritual God. She also resonated with the Jewish emphasis on action over belief. The path to being a good Jew is not only dependant on what you believe. You become a good Jew by how you act and what you do to repair the world and make it a better place. How does Judaism feel about converts? On one hand, our religion welcomes people of other faiths to join Judaism. The first convert in Jewish history was Ruth, who joined our people by saying: “Wherever you go, I will go. Your people shall be my people, and your God, my God.” On the other hand, there is the rule that a rabbi should purposely turn away a convert three times. Only on the fourth approach, can the rabbi begin the process of conversion. How does a person convert to Judaism? Conversion is a process that includes study of Judaism, attendance at services and holidays and meetings with the rabbi. When the study and preparation is complete, we go to the mikveh, a pool pure water. The convert removes all clothing and jewelry, and then dunks three times, completely under. The submersion is a symbol of the womb, and the convert comes out of the water “re-born” as a Jew. Hearing the three splashes of the water as I stand outside the door of the mikveh is very powerful. I also invite each person I convert to come to a Friday night service for a conversion blessing. Lily came a few Fridays ago for her conversion blessing. The path that led Lily to convert was a fascinating one. Lily was born in Hong Kong and came to America as a teenager. She married a Jewish man, but did not convert. After raising three Jewish children and cooking Passover dinners for 29 years, Lily realized it was time to unify her family and become Jewish. As a rabbi, it is an honor and a blessing to help guide the spiritual journey of Lily, as well as each person who wishes to join the Jewish faith. As a convert to Reform, I talked with many rabbis, and was never turned away or felt rejected. Thankfully - I felt so vulnerable and out of my depth, turning me away would have devastated me! My sponsor rabbi was supportive and still asked the hard questions. It was the perfect balance. I so appreciate the willingness of rabbis to take on oversight of conversion - we require a lot of extra work on top of normal job duties. Thank you! Settings of Silver had an excellent summary of the historical reasons why Jewish communities stopped converting people (after being open/enthusiastic about conversion); in summary, lots of death. The Jewish aversion to conversion seems to be a learned and internalized trauma - from the Romans' point of view, the most effective kind of policy. Now, millennia later, we are still enforcing their ( and subsequent regimes') policies for them.